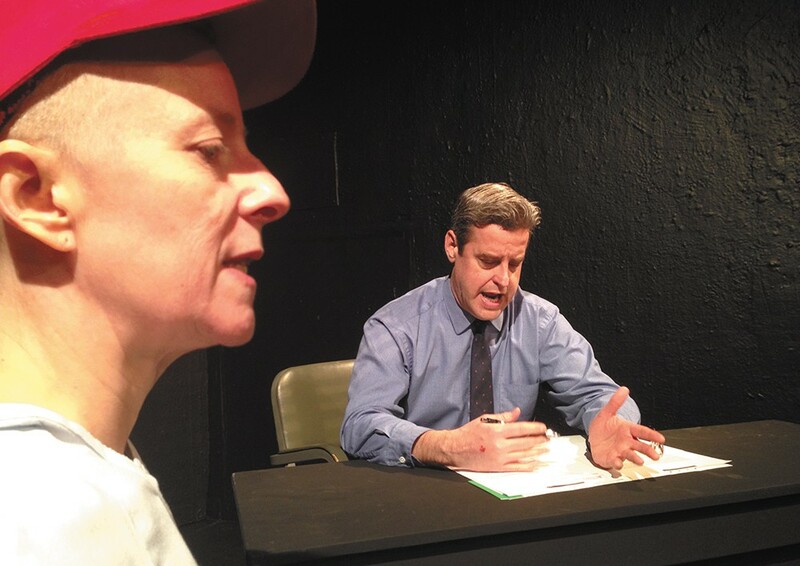 Diana Trotter (left) and Dave Rideout in Wit. "Death be not proud, though some have called thee/ Mighty and dreadfull," says Dr. Vivian Bearing, quoting aloud in Wit from John Donne's famous 17th century sonnet. Dr. Bearing — to her, her title is paramount — is an expert on Donne and, of far greater importance, is facing death from ovarian cancer. Though death be not proud, Dr. Bearing (played by a gaunt-faced, shaven-headed Diana Trotter) certainly is: a smug, haughty woman, quick to remind us of her intellectual superiority, her academic success, her unflagging rigor in teaching and research. When she steps onstage for her opening fourth-wall-razing monologue — barefoot, ball-capped, dressed in that uniform of abasement, the hospital gown — there's nothing humble about her. She grips her wheeled IV stand like a scepter. She mocks the insulting superficiality of the bedside manner of Dr. Posner (Brandon Montang) and nurse Susie (Janelle Frisque) with her own insults. One of Dr. Bearing's complaints is the dehumanizing aspect of her medical treatment; but to be fair, she barely seems human herself. That is partly intentional. In an overt parallel to her literary hero, she takes refuge in intellectual acrobatics rather than confront her own mortality. But at times her revelatory journey seems like an academic exercise in itself, with just enough pedantic discourse on poetry to massage the pretensions of Pulitzer judges, and the linguistic equivalent of name-dropping to feed popular ivory-tower stereotypes. As Dr. Bearing's disease spreads and its experimental treatment destroys what remains of her body, her sneering becomes self-pity, which does little for her likability. When it comes, her death invites sorrow because all death invites sorrow, not because she will be mourned by anyone as "my noon, my midnight, my talk, my song," in the words of a more contemporary poet. Wit's dialogue is dense enough on the page, let alone memorized and spoken, and Trotter's mastery of it is admirable, although her pinpoint enunciation can make her character seem overly stiff. This production, directed by Troy Nickerson, errs on the side of theatricality when some naturalism is in order, but on the whole it still packs the necessary punch.